LevelUP Wichita - This free public event is one-of-a-kind and is being put on by an Up the Ambition grant from the Wichita Community Foundation. The Sutton Place garage at William and Market will be transformed into a party space filled with vendors, live music, exhibits, yard games, craft beer options and tons of other activities. Head to the top for a live DJ and breathtaking view of the city. 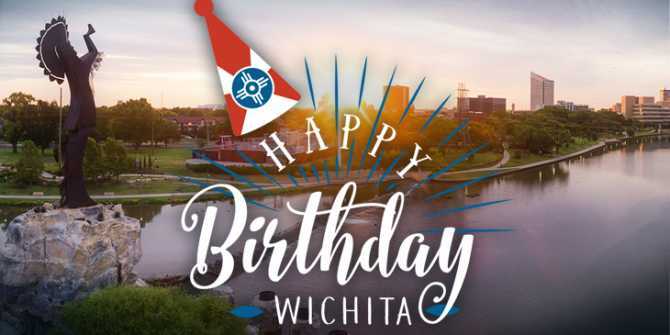 Wichita’s 148thBirthday Party - Bring a birthday card for the city and earn free admission into the Wichita-Sedgwick Co. Historical Museum. All four floors will be open with special tours, crafts, activities and refreshments. Splash Party - Looking for a great way to celebrate Wichita and beat the summer heat? The city’s Park and Recreation team is setting up a splash party at Osage Park. Kids of all ages are invited to partake in water inflatables, a duck pond, squirt gun games and many other activities. Wichitawesome Birthday Bash - Celebrate the city with steals and deals at Lucinda’s. All Wichita merchandise will be 20 percent off and patrons will have a chance to enter a drawing for four Wichita flag pint glasses. From 6-9 p.m., you can enjoy treats and drinks while you shop. Summer Birthday Bash - The Wichita Art Museum shares its 83rd birthday with our great city, so celebrate one of the best museums Wichita has to offer at the Summer Birthday Bash. Guests will enjoy an old-fashioned ice cream social with the Wichita Wagonmasters. Nifty Nut House will provide an array of delicious toppings while the Wichita Steel Drum Band entertains. During your visit, make sure you stop by the Art Studio to join in on a cool community art project. For more events happening this weekend or anytime, head to our calendar of events page.